A Nigerian based in Germany has asked to dump his Nigerian citizenship. 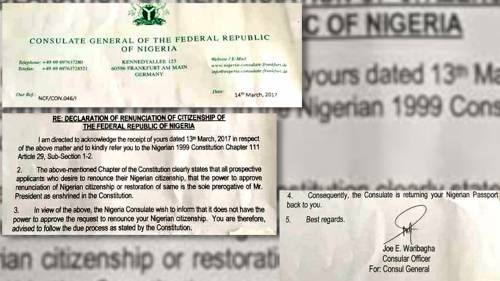 The request was made in a letter dated 13 March and addressed to the Nigerian Consulate-General in Frankfurt. The disaffected citizen followed it up by handing over his Nigerian passport as a prelude to severance of ties with Nigeria. However, the Consular-General responded that it has no power to grant the request. In a letter(Ref. NCF/CON 046/1) dated 14 March and signed by Joe E. Waribagha, Consular Officer, on behalf of the Consul-General, the Nigerian Consulate referred the applicant to Chapter 111 Article 29, Sub-section 1-2. “The above-mentioned Chapter of the Constitution clearly states that all prospective applicants, who desire to renounce their Nigerian citizenship, that the power to approve renunciation of Nigerian citizenship or restoration of same is the sole prerogative of Mr. President, as enshrined in the Constitution. 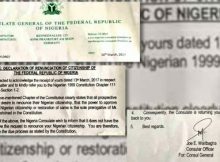 “In view of the above, the Nigerian Consulate wish (sic) to inform you that it does not have the power to approve the request to renounce your Nigerian citizenship. You are, therefore, advised to follow due process as stated by the Constitution. Consequently, the Consulate is returning your Nigerian passport to you,” said the letter.